Camperdown is a rural township on the Western District volcanic plains of Victoria. It is on the Princes Highway, 40 km west of Colac and 165 km south-west of Melbourne. Camperdown is famed for its early European settlers, the Manifold brothers. In 1838 John and Peter Manifold, who had brought sheep to the Geelong district from Tasmania two years before, explored westwards. They found the freshwater Lake Purrumbete (most lakes on the plain are salt or brackish), and good volcanic-soil grazing land in the vicinity of Mt Leura, a large scoria hill 1 km east of Camperdown. A school had been opened in old Timboon in 1854, and a National School was opened 4 years later. Presbyterian, Catholic and Anglican churches were opened between 1857 and 1864. The Wesleyans began to conduct services in a temperance hall in about 1868. 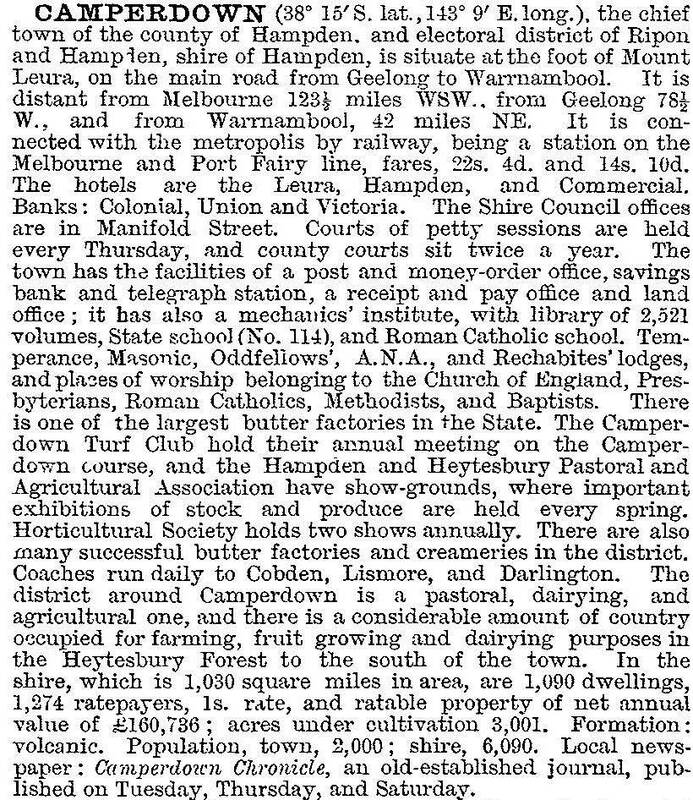 In 1863 the area around Camperdown was proclaimed the Hampden shire, and Camperdown was the shire's administrative centre. Camperdown became a service centre for wealthy pastoral empires. It became a stock sales centre, particularly when connected to Colac and Melbourne by rail in 1883. In addition to the Manifolds at ‘Purrumbete’, there were the McArthurs at ‘Meningoort’, James Manifold at ‘Talindert’ and several other pastoralists who made enough money to build expansive homesteads. It was the Manifolds, however, whose presence dominated the Camperdown landscape. A Gothic clock-tower was built at the intersection of the town's major commercial streets in 1897 in memory of a younger Manifold who died in a hunting accident. The main street is named Manifold Street, and is a divided carriageway with an elm-tree median. Several street-tree plantings were designed by the director of the Melbourne Botanic Gardens, William Guilfoyle. Camperdown had become a well-appointed township. Additional facilities provided in the next few years were a hospital (1907 – a Manifold gift), and a grammar school (1904). The Leura Hotel was rebuilt in 1902, becoming known as the grandest and most comfortable hostelry in the west. In 1921 a State high school was opened (288 pupils, 2014). An elaborately rebuilt Camperdown Theatre was opened in 1928. On 9 September 1952, Camperdown borough was created by separation from Hampden shire. Camperdown has retained much of its building stock, and it has been well maintained. Industries which have been established continued until recently: the Camperdown-Glenormiston Dairying Company Ltd (1960), was a merger of local butter factories of the 1890s, and became part of Bonlac Foods Ltd. It closed in 2000. A meatworks begun by the borough council in 1956 expanded to become an export abattoirs, closing in 1991. Plans were afoot for redevelopment of the dairy and abattoirs sites in 2011. Camperdown's commercial area tends to be overshadowed by the regional Warrnambool and Colac, although its retailing had 220 employees in 1988. At the eastern end of the Camperdown township there are Mounts Leura and Sugarloaf, volcanic scoria mounds. Mt Leura has a lookout and is the location of an annual hill climb rally. Manifold Street runs the length of Camperdown, with its elm-tree median and the Gothic clock-tower. At the western end there is a botanic garden (1874, heritage-listed), the volcanic-crater Lakes Gnotk and Bulleen Merri, with facilities for water sports, the showground and sports ovals. In the town itself there are State and Catholic schools to year 12, a hospital, geriatric and lone persons' accommodation, three hotels, three motels, a well-appointed caravan park, showgrounds, a swimming pool (1960), and five churches. About 2 km north of the town there is the racecourse, with one of Victoria's best known country grandstands. Historic buildings in Camperdown include the post office (1862), mechanics' institute, masonic hall, the avenue of elms, the clock-tower and the courthouse (1886). The historical museum is housed in the former Oddfellows Hall. The Old Timboon Inn (1855) is one of the few reminders of the first Timboon village, and is on the Register of the National Estate. Camperdown and its ‘lakes and craters’ countryside tend to be overlooked by tourists, perhaps because they are journeying to Port Fairy or spectacular coastal scenery, and perhaps because the Camperdown landscape does not have a well known vantage point. The view from Mt Leura, however, offers a rewarding perspective, as does the occasional open day for historic homesteads. There is an annual Leura Festival. On 23 September 1994, Camperdown town was united with Hampden and Heytesbury shires and parts of Otway and Mortlake shires to form Corangamite Shire. The shire's headquarters are in Camperdown. The population has gained an increasing proportion of aged persons as farmers move to the town in retirement. The state government's Department of Primary Industry office in Camperdown, that provided support and advice to regional farmers, closed in 2012. The former Camperdown Cheese and Butter factory was purchased in 2014 and renamed the Camperdown Dairy International to export milk powder and infant formula to Asia.